Along with the creation of MW’s new logo, MW decided to create fun little Treasure Tokens. These small 1.5 inch plastic disks have the MW Logo on them and are used to inspire the Quest! They include the MW clips of ‘Get Your Quest on with MW’ and ‘Join the Adventures’. We have begun placing them in Geocaches and at other allowable places we have searched for treasure. It is a way to not only inspire the Quest in others, but to also let other treasure hunters, searchers, or geocachers know we’ve been there. Imagine one found deep on a trail; it would be encouraging! If you find one of these MW Treasure Tokens please let us know! Email: TreasureTokens@mysteriouswritings.com or post a picture on the MW Treasure Tokens Facebook Page! Then put it in a place you travel to! Plus if you would like to help inspire the quest right away, encourage others on a trail, and leave a ‘Treasure Token’ to places you have searched for treasure, they are available for purchase here on this site under the MW Shop page. You can purchase 5 for $5, 12 for $10, or 20 for $15. ($1.99 Shipping (to the USA)). 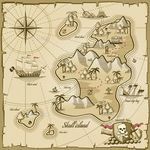 Everyone gets their Quest on with MW, as it is the ultimate treasure hunting website dedicated to sharing the latest in the search for treasures! Of all types! The more people who become inspired to search for treasure, the merrier! The MW Treasure Tokens Facebook Page is also a place where you can share photo’s and stories of the places you have traveled/visited while on the search for treasure. The world is filled with so many interesting places and we would love for you to share them with us! Mahlon and I often use ‘treasure hunts’ to take us to places we have never been before. I have to say that if it wasn’t for the Fandango treasure hunt, we might never have visited Mount Desert Island. And on the way there we stopped at numerous other locations of interest. We’ve visited places in the Rockies, we would have never gone to if not for The Thrill of the Chase, and again, made many side stops which were so unique. This is how it is for almost all the treasure hunts we work on. Questing is so incredible. We’v been to SO MANY places! Plus, soon we will be hiding Forrest Fenn Gold Medallions in the Appalachians for searchers to find. Might we place a few MW Treasure Tokens on trail to offer confirmation we were near? OR if you get out there in the Appalachians before us, and place some MW Treasure Tokens for us to see in our travels, that would be awesome too! Fun can be found everywhere……and so can treasure! Let’s give others a sign we are out there enjoying the Quest! Spread some MW Treasure Tokens around! But most of all…..Always Treasure the Adventure! For those who tried to purchase some MW Treasure Tokens, the Paypal link is now fixed.... It worked for some, others not. Hi Jenny. I just had a great idea for putting some of these out. How about taping/fastening a silver coin, like a dime, to it and burying it in a public park that allows metal detecting. That would be a fun find for someone for sure! OH that is an awesome idea! I will be doing it! Thanks TxTH! Love it! I'll add the Presidential Dollar Coins.... I love those. I will test that out too! You know I always wanted to send a message in a bottle...but a MW Treasure Token attached to a coin or two is the next best thing! Thanks for your creativeness.... I of course will let you know what happens!